We are pleased to announce the new issue of our Vine Times Newsletter! 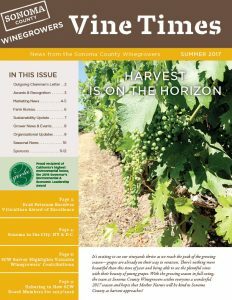 Published and delivered the last week of July, the Summer 2017 Vine Times newsletter features exciting information about recent awards and recognition, marketing news, sustainability updates, grower news and events, as well as organizational updates. If you did not receive a printed copy of the Summer 2017 Vine Times newsletter and would like to be added to the mailing list, please email [email protected].